Women's Sport Week (3-9 October 2016) is an opportunity for everybody to celebrate, raise awareness and increase the profile of women's sport across the UK. Most of all, it's a chance for more women and girls to get involved in physical activity. In fact, a number of sports organisations and clubs are using this week as an opportunity to introduce females to their sport, offering sessions to try out something new. In honour of Women's Sport Week, BBC Get Inspired and Radio 1Xtra present Body Talk, an intimate and interactive discussion on body image issues for women in and around sport. Radio 1's Adele Roberts will be chatting with a collection of open and honest women from the sport and entertainment worlds. Five-time Paralympic gold medallist Hannah Cockcroft, So Solid Crew's Lisa Maffia, two-time Olympic cycling champion Joanna Rowsell Shand, Olympic boxer Natasha Jonas, rapper Nadia Rose, TV psychologist Emma Kenny and Liverpool's own Olympic heptathlete Katarina Johnson-Thompson are just some of the people we'll hear from. The group will be talking at FACT (Foundation for Art and Creative Technology) in Liverpool on Thursday, 6 October at 14:00 BST. If you want a seat in the audience, you can apply for a ticket at the BBC Radio 1Xtra Live website. It's first come first served so be quick! For anyone not lucky enough to be in Liverpool, you can see it live on the BBC Sport and BBC Radio 1Xtra websites. Want to try out a new activity? Or maybe you are looking for a way back into a game you used to play? Lets us inspire you to revisit your childhood memories with some of these activities that you can get involved in where you live. Hockey is physically taxing and mentally stimulating. Plus, once hooked, players tend to make hockey friends for life. In England and Wales, Back To Hockey is a campaign offering women and men of all ages either a complete introduction to the game, or a return to hockey if you've had a break from it. If you are keen to get back into the game in Scotland and Northern Ireland, contact the hockey associations in your area who will be happy to help. From toddlers learning motor skills to adults looking for a fresh way to workout, everyone can get a kick out of learning gymnastics. Check out our guide for information on all different versions of the sport you can take part in. British Triathlon will be running tailored women only novice training days find out more here. If you have the basics but are no pro, this programme is for you. Tennis Tuesdays is hitting the courts in more than 80 venues across England, Scotland and Wales. Each week's session focuses on a different area of the game and you will improve your ability with a mixture of skills training from professional coaches and match play with other women at your level. You can have fun and be as competitive as you want, without feeling under pressure. If you are an improver or intermediate standard female player, find your nearest venue and sign up today. Whether you are new to netball or you have played in the past and would like to ease back into playing, there are schemes across the UK to help you. In Scotland, Bounce Back to Netball offers sessions that provide a gentle introduction or re-introduction to the game A similar programme run in England, Back to Netball, encourages beginners or anyone who is a little rusty to come back to the game. Contact Welsh Netball or Netball NI to find out about introductory schemes in these areas. Join over 24,000 adults a week and play rounders! All you need is basic equipment; bat, ball a decent bit of outdoor space and some willing friends and family. In aid of Women's Sports Week, Rounders England are hosting the Golden Bat Relay the idea is that one team will play a game starting on Monday and then pass the bat onto another team who play with the gold bat on Tuesday and so on for five evenings. Matches are taking place in Gloucester, Cornwall, Winchester, Leeds and Burnley. There will be a mix of indoor and outdoor rounders played throughout the week. To find out more information head to the Rounders England website. Not in one of those areas but still want to give it a go? Try our guide to find a team near you! Yoga develops strength, flexibility and physical and mental stamina through a variety of stretches and postures. There is a type of yoga for everybody, and it is perfect for those looking to increase their fitness, flexibility or just trying to relax after work. Find out how you can get involved in yoga with our handy guide. Remember, Yoga isn't competitive, so you don't need to worry about being the new one in the class! The term martial arts covers such a large number of different sports, so there is sure to be one discipline that appeals to you. What all have in common is the benefits you can gain to your fitness and confidence. The scope is vast, so if you're thinking of getting involved but don't know were to start, we've got all the tips you need here. Dancing is good for your soul! What's more, it's a fun (and very social) way to work up a sweat and stay fit. Are you inspired to try dance? Or maybe you are a keen enthusiast already? With many different styles in our dance guide you are sure to find the right fit for you. Farah Jamil joined Bellahouston Boxing Club in Glasgow just to get fit and now boxes competitively. Boxing is a dynamic sport that teaches physical and mental discipline, and the training that comes with it is amongst the most intensive in sport. It provides a thorough full-body workout, and can be a lot of fun too. It's also a fun and effective way of developing communication skills and can help people with self-esteem. Looking to perfect your punch or just wanting to keep fit, find out how with our boxing guide. For some the idea of gym fees and exercise equipment can easily put us off, let alone trying to find time for it in our busy lives! We've done some research to find you some ways to get started that are free and, best of all, that you can do from home or anywhere else that fits your schedule. Find out more here. 1. Gather your female friends and family and have some fun - test yourself with one of our #MakeYourMove challenges you can try Hula Hoop, Tai Chi and even the YMCA! 2. 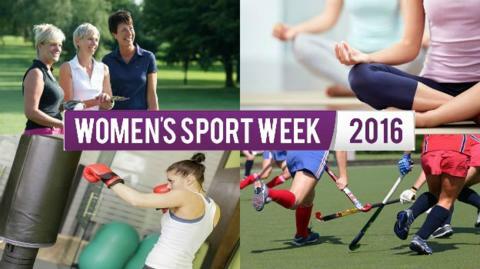 Put your postcode into our Women's Sport Week promotion on the Activity Finder to find a session near you. 3. Use #BBCBodyTalk to join the conversation or put your own question to the panel. You can also email us. Join the conversation on Facebook or Twitter. 4. Date for your diary - Sport Scotland have an Active Girls Day on Friday 28th October, where they are encouraging girls to get active within their communities. For more information visit their website here. 5. Fill us in on your week by sending us your Women's Sport Week videos and pictures using #WSW16. Read more on Women's Sport Week 2016: What is it and how can you get involved?